Very Little Knowledge: On Color or Anything Else | Knit Like You Mean It. Kettle-dyed yarn can be great for beginners, who enjoy looking at the changing colors and can more easily differentiate among stitches in variegated yarn. We’re talking hours of my life I will never get back. I am coming to the conclusion that this post is just not meant to be written by me. It’s not that I don’t have the knowledge, or the experience. It’s just that I don’t have anything to add to the conversation about color, and also I have generally learned my lessons about color after making ridiculous mistakes about it, and also I feel like I might be losing my mind. That last bit has nothing to do with color or even knitting in general. It’s just that being in England is making my head spin. Mr. Trask and I have planned this move for the past two years, and yet it never quite seemed real. Now, it is real, and that is both wonderful and weird. We are still turning to each other from time to time and saying, “We live here?” Please don’t think I’m not grateful to be here, because I am. It’s just an odd feeling: everything is a little bit difficult. It’s much harder to get a bank account or a cell phone contract here than in the States – and we still don’t have any furniture – and meanwhile lots of boxes of books are arriving – all that jazz. Meanwhile, many points of reference that I had taken for granted are suddenly not there. 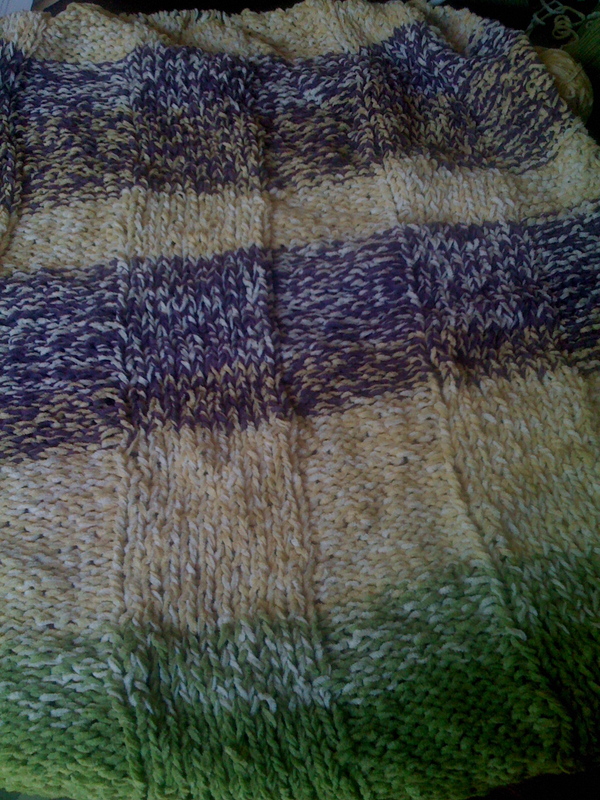 Here's an ugly rug I knit a long time ago. Just to pick an example out of the air, think of when you go to the yarn shop. Picture, say, the biggest yarn shop in the world, with all the brands of yarn all laid out. There’s Red Heart, there’s Malabrigo, there’s Debbie Bliss, there’s Miss Babs. Now, when you see Red Heart, you know it’s going to be reasonably priced, even cheap. When you see Malabrigo, you know it’s going to be wooly and soft, and much more expensive. When you see Debbie Bliss, you know it’s going to be somewhere in between the two, but a good choice for lots of projects. When you see Miss Babs, you know it’s hand painted and made by a small woman-owned company. Right? Also, not to go off on a rant (too late), think of the cleaning supplies aisle in the grocery store. There are all different kinds of cleaners there, for all different purposes. Your eye sorts these by brand and logo at first, because you know in the back of your head that Cascade is usually dishwasher soap while Palmolive is diswashing liquid. If you don’t have that easy sort function installed in your head yet, there’s just a lot more noise that you have to interpret. And, really, I wanted to move here – I am loving this city – this is what some might call a luxury problem. I’m going to be fine, so why am I complaining? 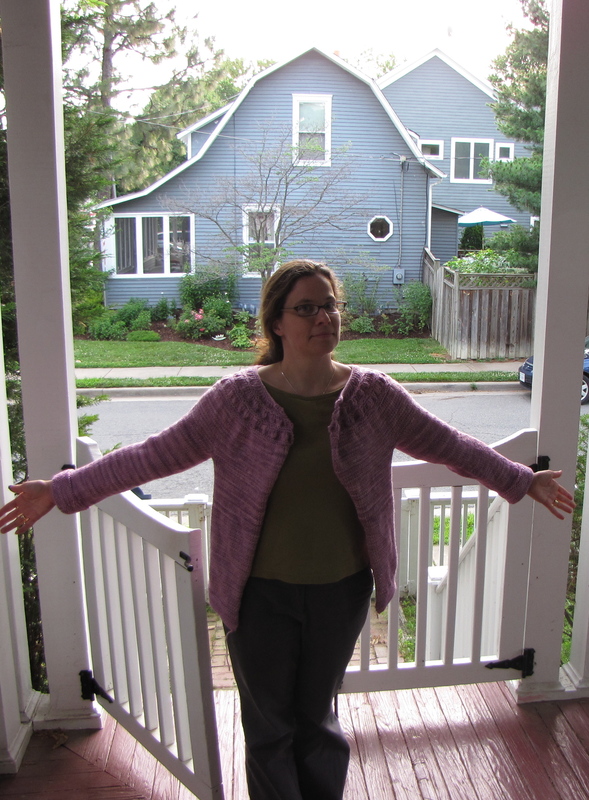 And here is a sweater I knit that, when I showed it to a friend, she said, "Wow, it was really brave of you to pick that color." First reason I should not write about color for you guys: One of my favorite outfits when I was in high school was a pair of orange climbing pants and a purple sweatshirt. Second reason: When I started writing fiction, the very first story I wrote was about a woman trying to describe color to a woman who had been born blind. 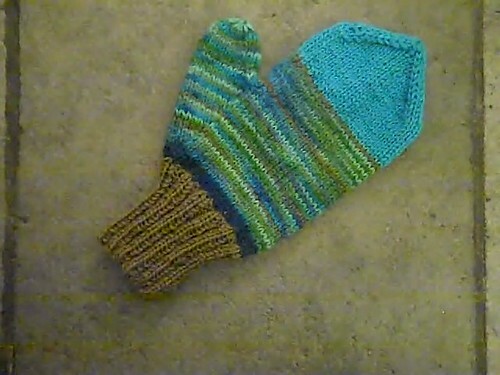 Secret about me: I think beginning knitters should be given variegated yarn. Based on the beginners’ classes I’ve taught, this seems to help them distinguish one stitch from another, and it helps them talk about knitting (“so I pull the green over the red?”), and it’s fun to watch the colors change. Another secret: I have knit, not just one, not just two, but four hideous blankets due to poor color combinations. Um. I kind of love that ugly rug. (It reminds me of a half-square triangle quilt.) But what do I know? I am wearing purple and orange right now! It’s okay that even the good and long-desired things are challenging sometimes. Sarah, I agree about the anthropological study! I have been doing that: stepping back and realizing how packaging affects me, what it means to me, etc. We’re always half-aware of this, I think, – and now that it is one of my only points of reference I am doubly aware of how misleading it can be! So interesting. The Bakery on Main is available @ Morrison’s. Regarding color, you aren’t the only one with that problem> I guess it is a trial and error kind of thing. I will never be Alice Starmore. If I can’t copy the color combination and have to come up with my own, it never turns out quite like I expected either. Hee! I think I am on your color wavelength, I’m with you. It’s all to do with the fact that I’m born to be NOT an artist. No talent. No natural inclinations. I tried dying yarn, and I loved it! But the first colors I combined were yellow and purple – apparently a no-no, who knew? Nevertheless, I am most impressed with your tenacity. A new country is no doubt a huge and overwhelming new challenge – and there you are right in the midst of it, taking it on. Looking forward to hearing more about it, you go girl! Doesn’t mean it isn’t exhausting. In fact, my understanding is that because you’re in a closely related 1st world country and don’t have to make the language shift, the culture shock is worse because you expect less of it. You should hear the kids who have gone (all of 200 miles north) to Canada talk about culture shock. LOL! I like choosing a variegated yarn in a common weight, usually DK, and then picking solids that MATCH, and I mean match, the colors in the variegated. That means the coordinating is done for me. 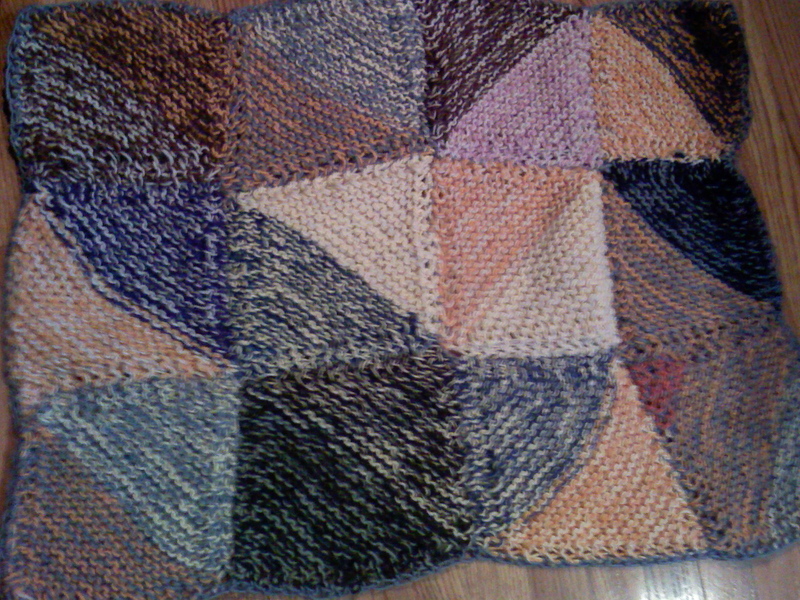 Then I can do stripes or mitered squares or whatever and it looks pretty good. Also, art classes that have nothing to do with knitting can be a help. Learn the color wheel without the stress of knowing that your obsessive interest — knitting — will be impacted by your choices. 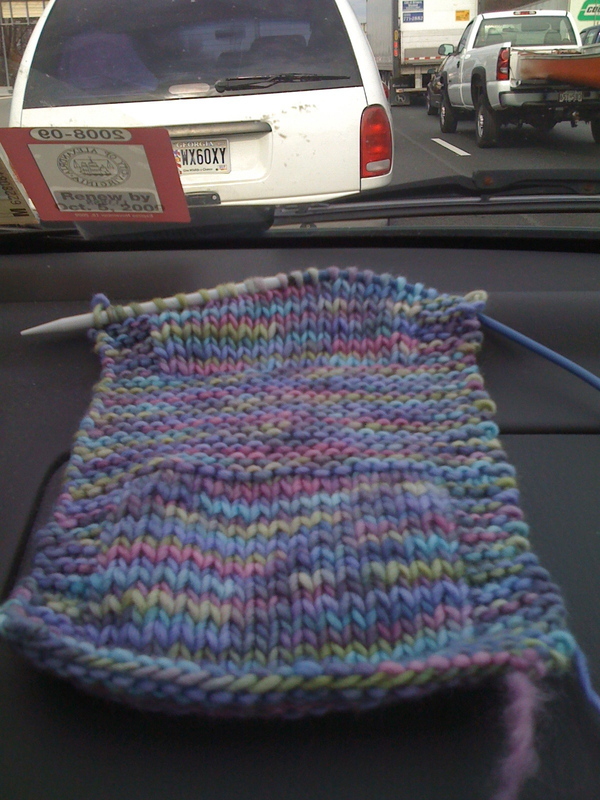 THEN go back to knitting color choices. Oh dear. I think I had convinced myself no one else would. But they were memorable, weren’t they? I don’t really have a problem when combining colors, but that’s probably because I’ve been drawing as a hobby since school and have long since figured out what colors match best. Usually, when I don’t know what colors to choose, I try to look for an example in nature. Let’s say you have a dark blue yarn, then you can try to copy the colors on a night sky (dark blue, black, some silver, maybe purple and white) or the ocean (dark blue, azure, white, some green), for green – grass and sky (my favorite – forest and spring greens with sky blue), or a rose (green plus red/rose/yellow, matches well with white), etc. For contrasts, I’d use the opposite colors on the color wheel. Dovile, your suggestion about looking at nature is brilliant. Thank you so much for sharing it! I am going to do this from now on. Lately, I have taken to photographing color combinations I think are particularly impressive or interesting, so I can refer back to them later. As a fellow US Citizen living in the UK, I have nothing but empathy for you. It took me three weeks to figure out how to lock an outside door (you have to turn the handle up?!?) and another two after that before I trusted myself to cross the street on my own and I still have the occasional close call because, while I _saw_ the on-coming car, my brain assured me that cars coming from that direction _must_ be on the other side of the street! The first time I went grocery shopping on my own I had to call an English friend to walk me up and down the aisles of a shop he’d never been in, describing what things would look like and what they’d likely be near. My first half-dozen trips all ended in tears and it can still be incredibly frustrating trying find something I’ve not looked for before. UK Yankee (http://talk.uk-yankee.com/) is a forum for USC in the UK and there are threads about everything from finding a tin of Libby’s pumpkin puree (Waitrose, if you’re lucky) to when and how much to tip (rarely and 10%) to understanding the local lingo. One of my favourite blogs is Separated by a Common Language (http://separatedbyacommonlanguage.blogspot.com/) by an American linguist living in Sussex who writes about differences in American and British English (with occasional comments from Canadians and Aussies). Oh my goodness. Jennifer, this is so helpful. Thank you, thank you! my other problem with color is that i never pick colors that contrast enough..i always pick two colors that are the same value and wonder why the design doesnt pop the way i want it too..as far as variegated yarns….i always thought the variations would overwhelm the pattern i was doing..( i have a penchant for ridiculously involved knits) I also was afraid of the bold look of them…like the idea of making an entire sweater out of it..never! 🙂 It took me a long time to shake my perfectionist tendencies when it came to knitting..when i started i desperately wanted all my knits to look store bought for some reason..like handknit had some diminished value (i blame society on that one)..and i never saw a store bought variegated sweater..im slowly starting to embrace them..im really into cakewalk yarns..their variegated stuff has a speckled texture that i like.. I was thinking just a couple days ago that I don’t recall seeing variegated yarns used much outside of handcrafting, I thought it might be that as a man I’m usually seeing the duller side of mass-produced knit fashion. I can’t help but think that replacing assumptive momentum with cognitive action must be a very good thing that I’d like to try. When something that always works suddenly doesn’t – yes it’s frustrating, and I empathize with you – but I don’t deny envying you for even the frustrating aspects of your jouney. When I think of how much of every day I float thru instead of experiencing, I feel just a little less alive. I think I’ll go kickstart my brain by working on some color theory! I want to read your first story.